As I reported recently, the Trump economy is moving along nicely. 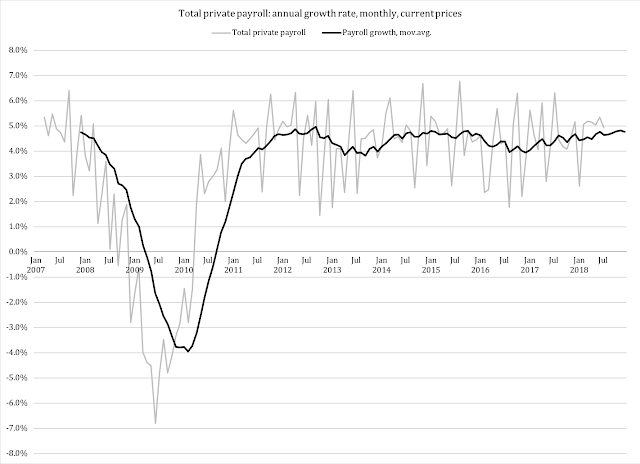 Growth rates are not as spectacular as some would suggest, but the trend is steadily upward with gradually higher growth rates and steadily better employment figures. --the rising rate of capital consumption vs. fixed capital, indicating a capital stock that is on faster turnover. The second point is not necessarily a problem given that investments in equipment and, especially, intellectual property products, IPPs, (primarily computer software) are growing notably faster than investments in structures. Since IPPs grow obsolete much faster than structures, this can explain at least part of the rising turnover rate of the capital stock. To further drive home this point: in the past ten years, businesses in America have invested almost $8.2 trillion more in IPPs than in structures. That said, the higher turnover rate indicates a more short-sighted philosophy behind gross fixed capital formation. It is easier to move business operations with shifting macroeconomic and microeconomic conditions, and to increase or decrease current investment spending depending on economic growth, regulations and tax policy. 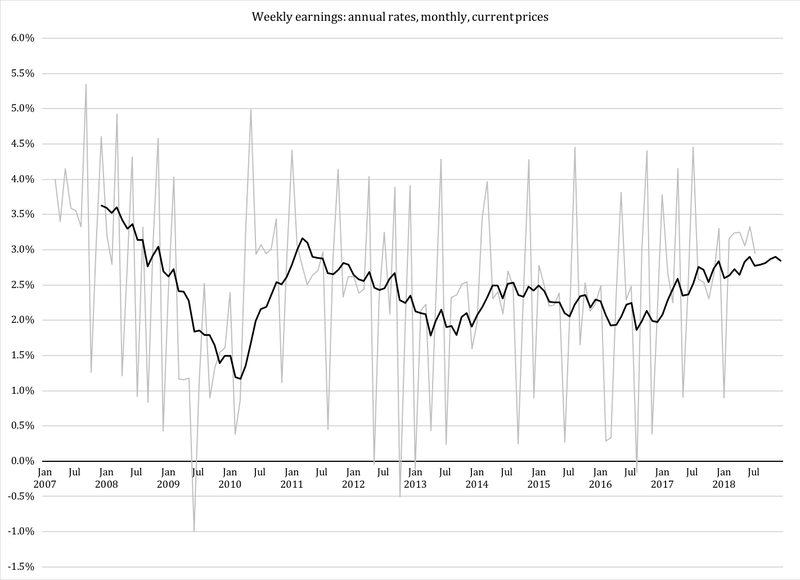 Given the shifting nature of business activity, and the sluggishness of the economy to break through the three-percent growth barrier, it is encouraging to see some positive long-term trends on the U.S. labor market. 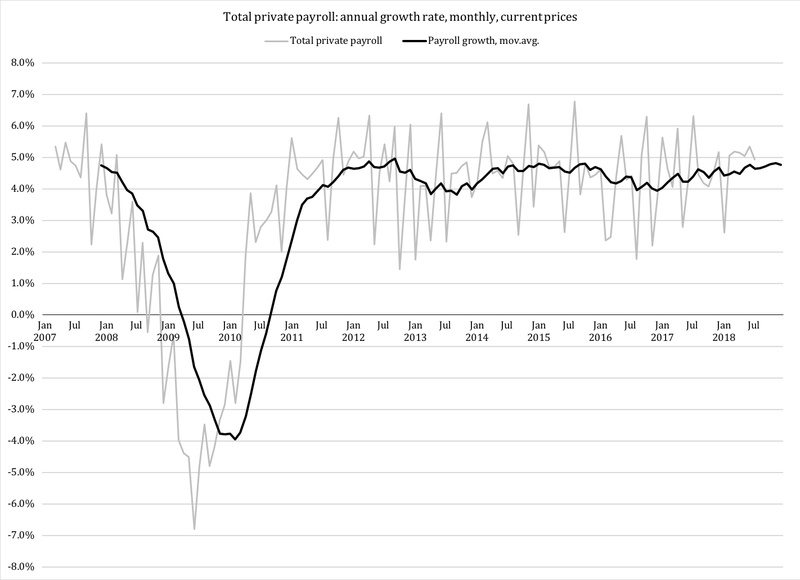 In addition to the low unemployment rate - in itself a great achievement in light of the protracted stagnation under the Obama administration - Bureau of Labor Statistics payroll data show two noteworthy trends. In the aggregate, American workers are doing well under Trump. There are differences between industries and age groups, but the overall trend is clearly positive. This is encouraging for the coming year: strong household earnings feed back into the economy through consumer spending. There is a good chance that the economy exceeds three percent growth on an annual basis during the second half of 2018.